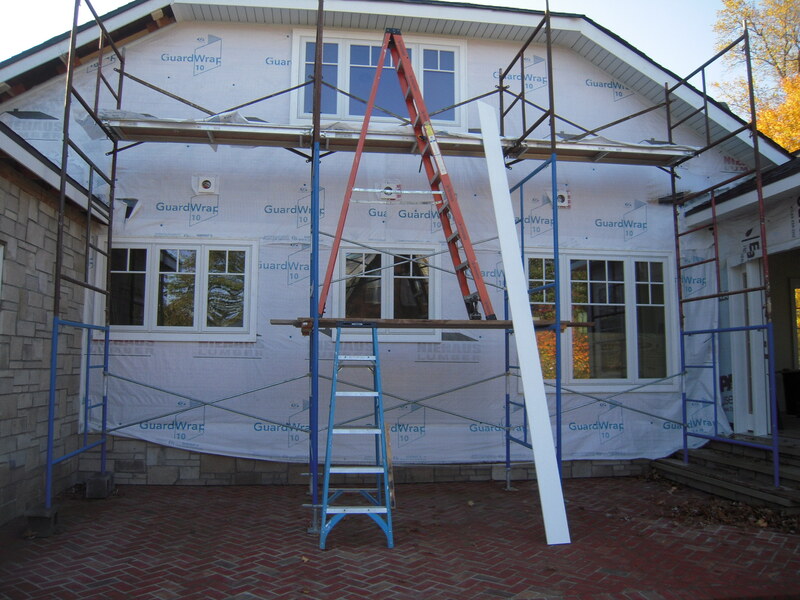 So far, so good- we were able to get some of the tall stuff done – like the pointy front of the house. It was pretty easy because it was only one section of scaffolding two units high. 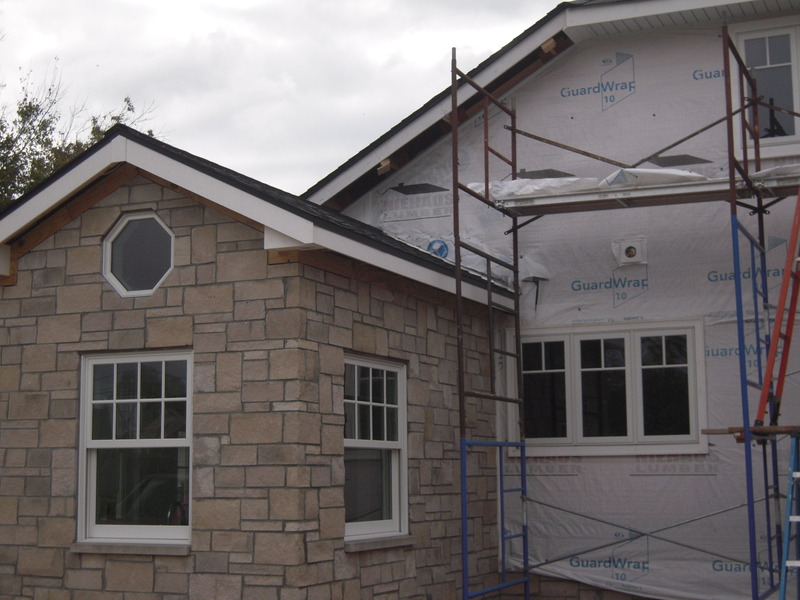 And we’ve been able to get the fascia and soffit wrapped around the sunroom without incident. 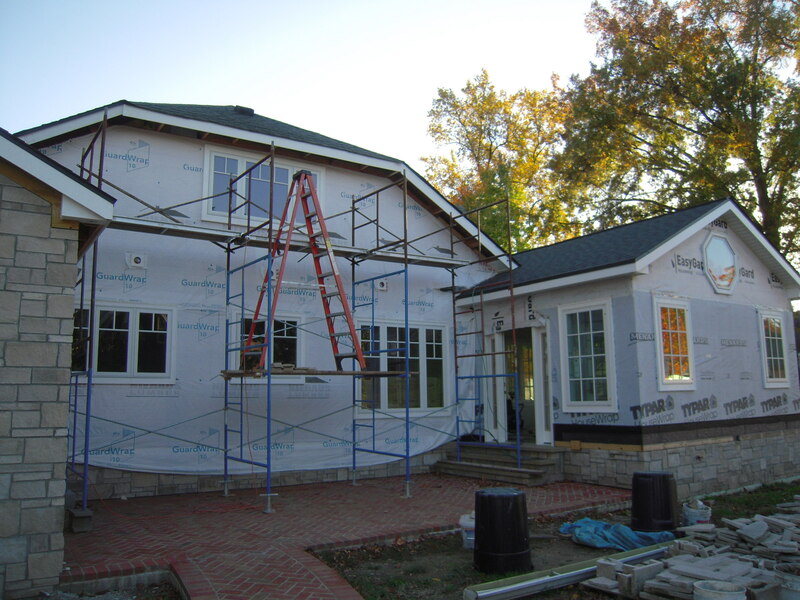 Now we go for a bigger project – the sides of the house. We’ll do the tricky side first. 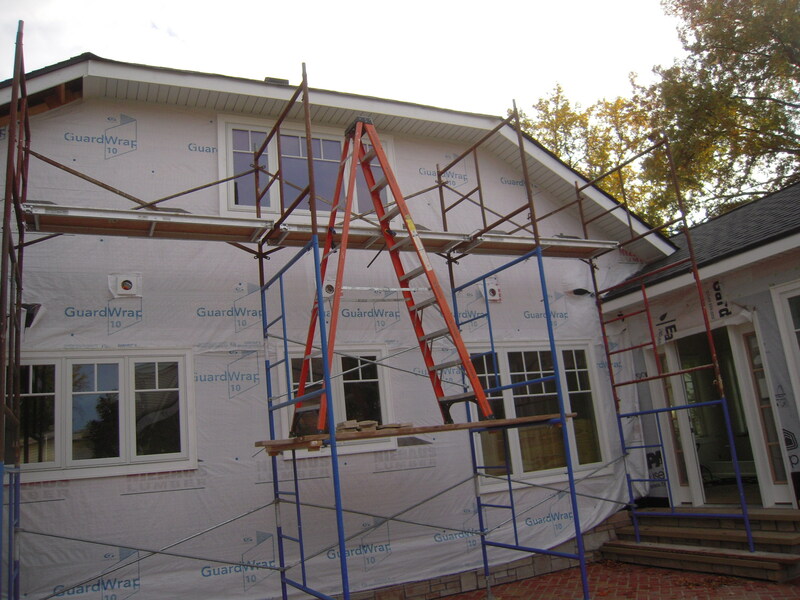 The 1st problem is scaffolding. It takes a little longer for a 60 year old who still walks like a penguin from last year’s experiment with gravity to get things in order. This is set up #2. I put it up once, but could only get two sections wide – so down it came and this configuration went up. That took about 2 1/2 hours of my life. I’ve got the center and right hand fascia in place, temporarily fastened with cortex screws. Azek that rests slightly above the roof surface. The panel is removable when the sunroom needs to be re-roofed. Black roof caulking covers the small gap between the Azek and roof surface to keep any water or insects from getting in. I’m using Quality Edge TruVent hidden vent aluminum soffit. 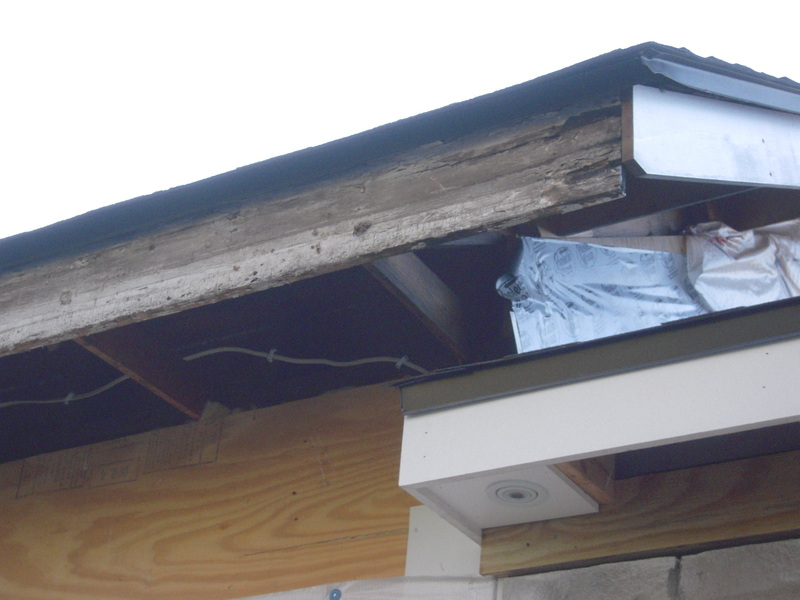 It has no visible holes and looks more like the original type of soffit that was on this home. Problem #3 is because there was no plan when I started building this place. The siding and trim detail are going to be a problem here. Here’s a close-up of the problem. 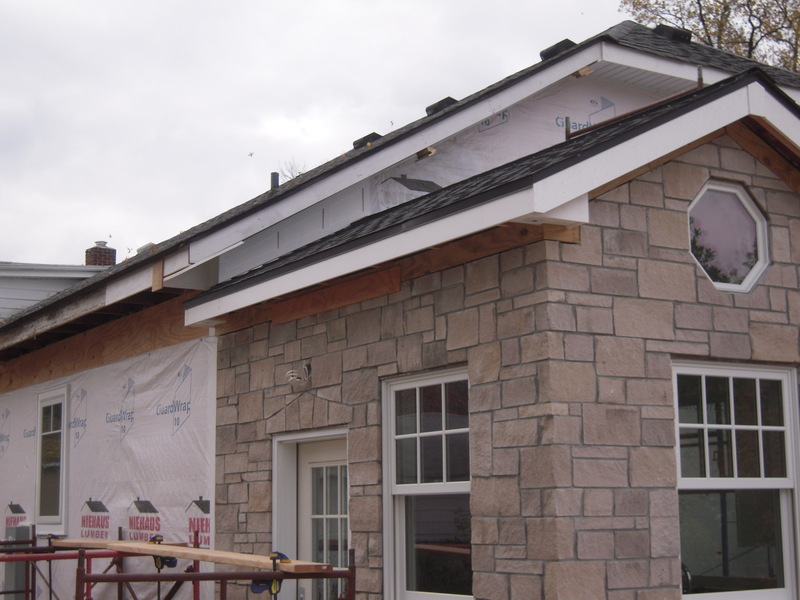 We’ll have frieze trim below the soffit and we’ll have another trim piece right above the mudroom roof surface. If we leave it as is, it will have tiny pieces of siding on the wall here. So my solution is to make an Azek panel to span this roof area under the eave. I made a plywood template to make sure I got all of the angles right. 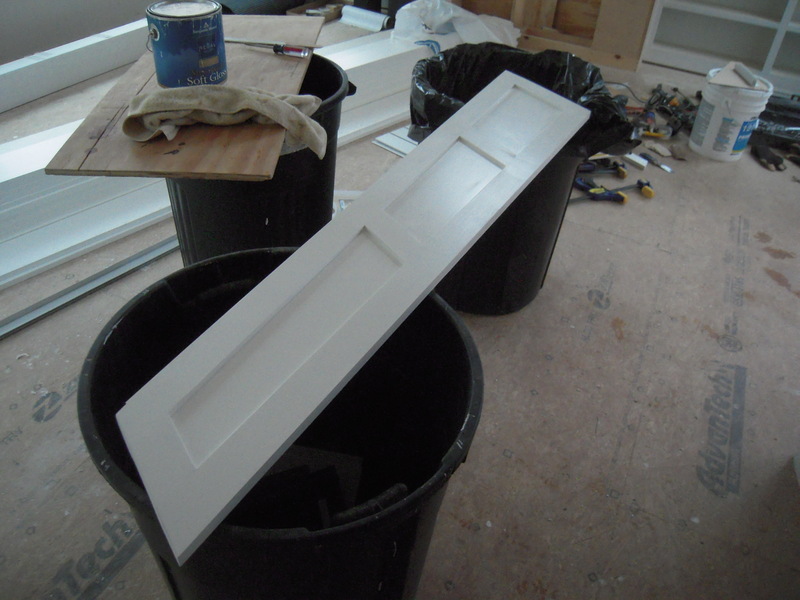 The original roof is a 7/12 and the mudroom roof is a 6/12, so this panel had to taper to fit the odd angles. Also the upright elements had to be plumb when in place to make everything look like it’s supposed to. 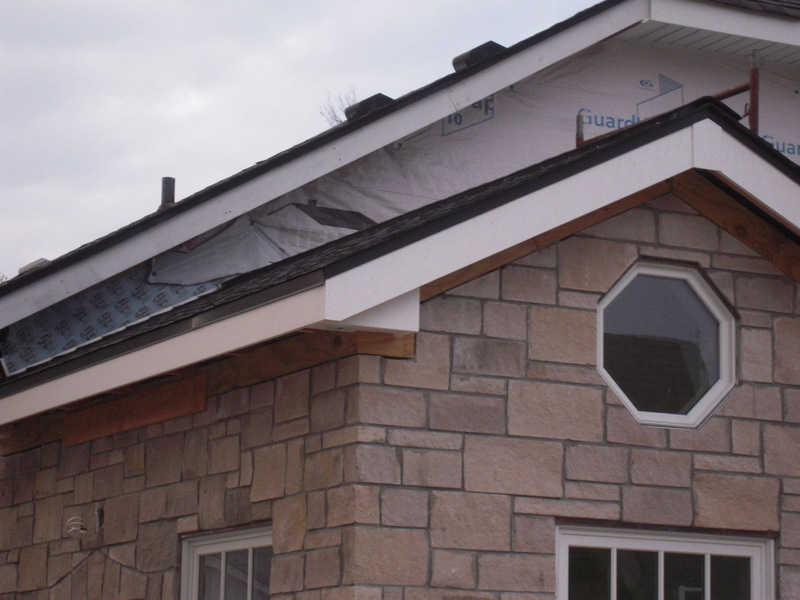 I used the original fascias on most of the house as backer for the new Azek trim – but this piece had to be replaced – as did all of the original fascia on the patio side of the house. I fastened the panel in place with removable cortex screws. 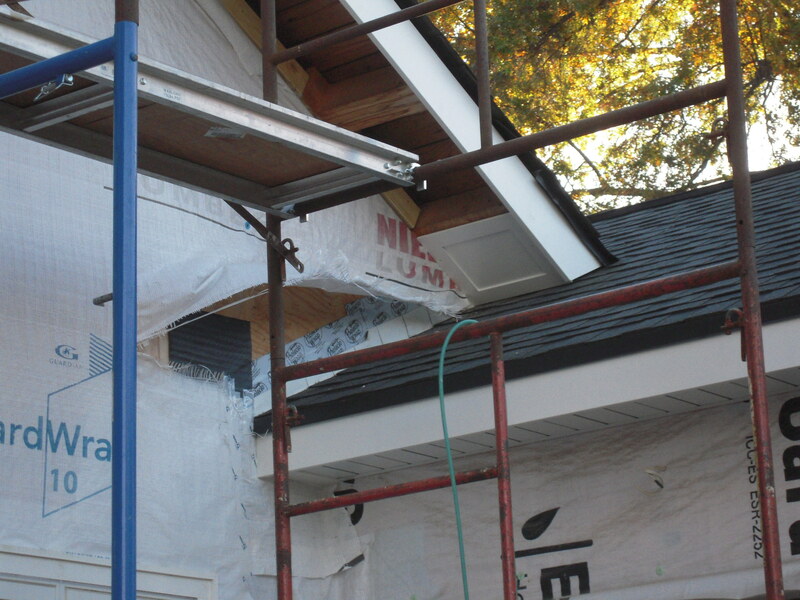 The panel then had to be wrapped around the corner with more trim pieces to meet the eave soffits. I’ll detail that in another post. Looking from the other way, the side panel ends at the roof ridge. This will allow the siding to terminate here instead of having those tiny pieces under the eave. Now to put the other 15′ fascia board up. Working alone has it’s challenges, but the good thing is you can go as slow as you want. Hang in there fearless renovators – we’ll get through this together – even if I’m doing all the work. 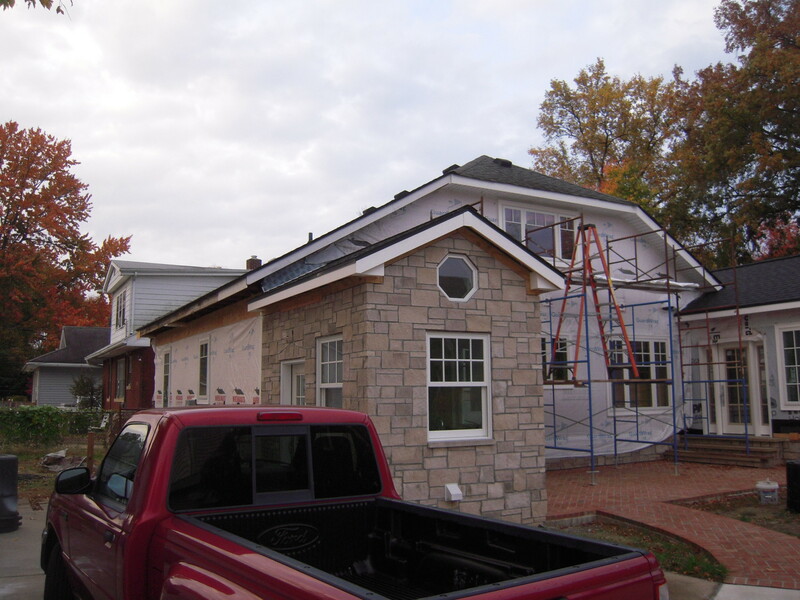 This entry was posted in Exterior Remodeling, Home Renovation and tagged 1930's bungalow, Azek Trim, Fascia, Frieze boards, Home Renovation, Old Home Renovation, Remodeling, roof surface, scaffolding by curt. Bookmark the permalink. Coming along nicely!! I love the shape of the house. I love your pain/joy! Lots of work but doing things the correct way has it’s benefits. Looking forward to seeing the progress. Thanks Dave. Pain/joy is very true. But wouldn’t want it any other way. To me it’s a hobby – and it’s a lot of fun too. Looking good. Wish I had your patience (and handy skills).